Nier: Automata came out two months ago on PC. It’s a really good game, and a clear standout during an unusually strong spring. So why the heck is the PC version still loaded with basic bugs and other problems that haven’t been patched? I spent last weekend blasting through Nier: Automata on PC. I got endings B, C, D and E and… well, you should really play this game. It’s great. For all its positive attributes, though, it has significant issues on PC. Crashes, weird performance dips, locked white screens, and problems with funky resolutions affect even the most powerful PCs. This reddit list from a month ago catalogues many of the issues to hit PC players. In the meantime, they’ve released one piece of paid DLC, which included some new challenges and costumes. Each official Steam update about the DLC has been trailed by a collection of frustrated comments, presumably from people who own the game. “Patch your damn game!” “Fix the game before releasing DLC.” “Yeah, ignore the buyers even more while you hurry up to release a crap DLC to milk more money.” And so on. Happily for those of us who just wanted to play this (again, very good!) game without waiting for a patch, a couple days after it hit Steam, a user who goes by Kaldaien released the Fix Automata Resolution (FAR) patch. 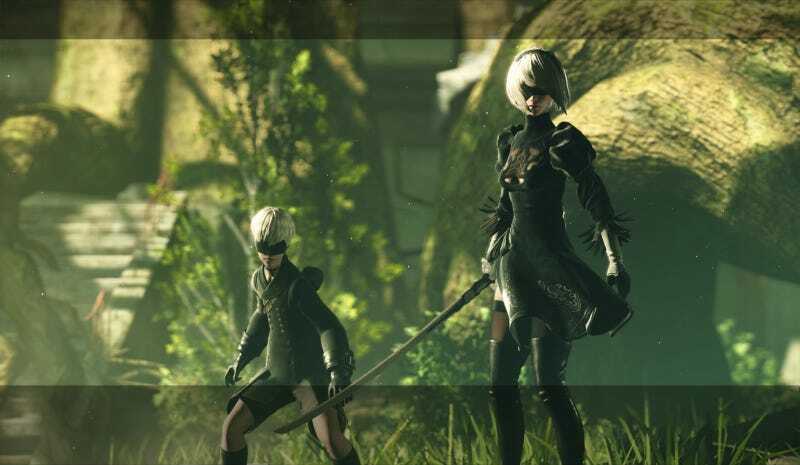 Kaldaien’s patch helps Nier work in full screen at a proper resolution while also addressing some general performance issues. The patch has become indispensable for a lot of PC players, maybe even most. I certainly use it. Without the FAR patch, Nier is incapable of running in fullscreen at my monitor’s native 1440p resolution. It resizes a stretched-out, lower-resolution image, even though the menus tell me it’s running in 1440p. Helpful as it is, FAR is not a perfect solution. My Windows mouse cursor still appears over the game after loading screens, and I have to regularly move it over to the side of the screen so it isn’t annoyingly in the way. Most times I boot up Nier, FAR requires an update, which aborts the boot process. It also gets grumpy if I try to start the game while running FRAPS, which, fine, but it’s pretty pushy about it. While FAR does seem to help with some performance issues, I still get odd hitches and frame-rate drops from time to time. Given the hardware I’m using, it doesn’t feel like those should be happening. And I’ve seen plenty of people reporting all manner of crashes and freezes that FAR doesn’t claim to address in the first place. It’s a strange state of affairs when a fan patch remains this crucial for this long on a high profile, big budget game like Nier. Some of the issues still affecting PC gamers are the kinds of things that would be immediately patched out of most PC games. Take, for example, the fundamental thing FAR is fixing: the game is displaying at the wrong resolution. I don’t know from game development, but that doesn’t seem like a complicated problem that should require months of work in order to fix. FAR was able to remedy the issue with a minimum of fuss almost immediately after Nier hit Steam. The Borderless Gaming app also worked for me right out of the gate simply by forcing the game to display in windowed borderless mode at the proper resolution. Nier: Automata is a hell of a game, and it’s a shame so many people have to jump through hoops just to make it run properly. A fan-made patch shouldn’t have to carry a game this big for this long.